What do do with them?! Friend and esteemed colleague Nick Malgieri told a class that he saved them in a huge container and when it was full...he threw them out! i've filled my freezer with them, occasionally making an angel food cake. Recently I decided to discard the 2007 and 2008 containers. Too late, my husband Elllott reminded me he likes egg white omelets. I still had the 09 batch so he was not deprived. 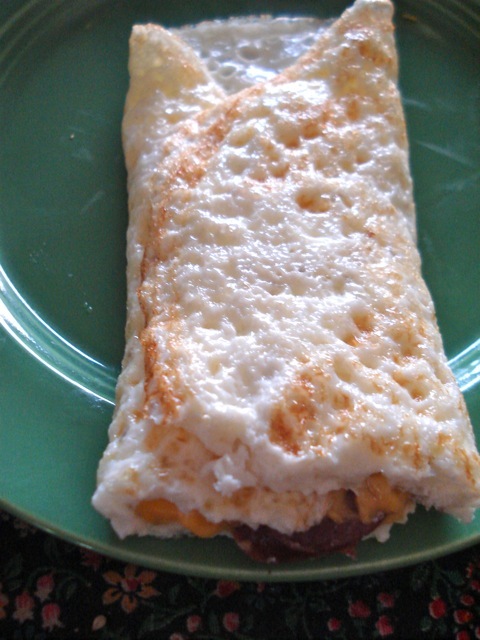 I set out to perfect his omelet. As Elliott was aspiring to eliminate as much cholesterol as possible, i heated a small non stick frying pan over medium heat. When it reached 350˚F (hot enough to make a drop of water sizzle) I sprayed the pan with baking spray (Pam) and poured in 2 lightly beaten egg whites. I sprinkled them with a pinch of salt and freshly ground pepper. The first time I rolled it up and served it plain but the second time Elliott organized 3 slices of cooked sausage and a few pieces of cheese. When I lifted an edge to assure that the bottom was nicely browned, I turned the heat off and set the cheese and sausages in the middle of the set egg white. 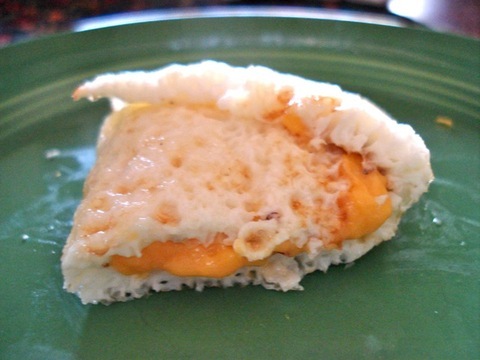 Then I flipped over each side of the egg white to cover it and let it cook for about a minute to melt the cheese. (The plate was heated first in a low oven so it worked perfectly but it would also work to zap it in the microwave for 7 seconds on high. Now I'm looking forward to collecting more egg white (no problem), and while waiting to be transformed into Elliott Omelets they serve to keep the freezer more filled. Freezers work most efficiently when filled even if it means filling milk cartons with water and freezing them so why not egg whites instead? !